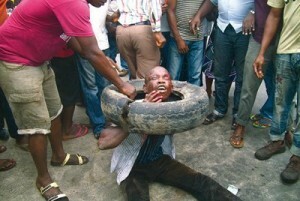 This man was alleged to have stolen a neck chain in one of the popular markets and the people who caught him felt the best way to go about the issue was by burning him to death. The faces of the murderers are shown in the video (which we won’t upload and Youtube has even pulled it down). We are hoping the police would swiftly make some arrests as they did in the Aluu4 case.